If you’re unhappy with your smile and would like to take steps to improve it, we can help. Would a small change in your smile increase your confidence? From repairing that chipped tooth, changing a grey filling for a white one, whitening your teeth to get rid of those stains or straightening your teeth with braces, there really is a bit of cosmetic dentistry for everyone. To arrange a consultation, contact our practice today to speak with one of our dental team. Whichever treatment you need, you can rest assured that every step of your journey will be undertaken with the greatest care, skill and attention to detail, using the finest materials and latest techniques. Cosmetic dentistry is the art of making changes to your smile to improve the appearance of your teeth, gums or the way your teeth fit together. Here at the Dentist at Liberty Place our cosmetic dentists take plenty of time to chat to you about the way your smile makes you feel. If not, how can we help? Our team of cosmetic dentists are experienced with the best methods of making changes to your smile, whether it be a small adjustment that makes all the difference or moving your teeth into a straighter and more natural looking position. The Dentist at Liberty Place is a credit broker authorised and regulated by the Financial Conduct Authority that has a commercial relationship with the lender Hitachi Capital (UK) plc. It can be really difficult to choose the best cosmetic dentist near you. It’s so important that your new dentist discusses with you what you would like to achieve from a more cosmetic smile. It is, after all, your smile! A healthy smile is always paramount before making any cosmetic changes. On a healthy mouth, cosmetic dentistry works better and lasts longer. This means that the first part of your smile makeover here in Birmingham will be an assessment of the health of your teeth and gums. Your treatment plan will always include the routine care of your smile so that your investment into cosmetic dentistry lasts as long as possible. With the advancement of dental technology, and dental materials, cosmetic dentistry has become increasingly popular amongst people of all ages over the years. Various treatments and options are now offered to patients to improve the appearance of their smile. Everyone, regardless of age or gender likes to feel confident and cosmetic dentistry can be just the thing to help you on your way. The most common cosmetic treatment carried out is composite fillings. A composite filling is a tooth-coloured filling used to restore decayed or broken teeth. These fillings are used as an alternative to amalgam (silver) fillings, which are aesthetically poor. This is more and more common than ever before. Whether it’s a Hollywood white smile or just a brighter appearance for a special occasion, teeth whitening is a gradual and self-directed treatment under the careful monitoring of your dentist. Tooth whitening can change your whole smile in just two hours. The type of braces on offer include traditional metal braces or for those looking for more discreet options, clear braces such an Invisalign or ceramic tooth-coloured fixed braces are also readily available. Crowns, sometimes known as ‘dental cap’, are a type of dental restoration which completely caps or encircles a tooth or dental implant. A crown is designed so that it fits in perfectly with the surrounding teeth so that no one ever knows its not your natural tooth. A veneer is a layer of material placed over the surface of a tooth. Veneers improve the aesthetics of a smile and/or protect the tooth’s surface from damage. Dental Implants are used to replace a missing tooth with a fixture that moulds with your jaw like a new root to look and function as a real tooth. 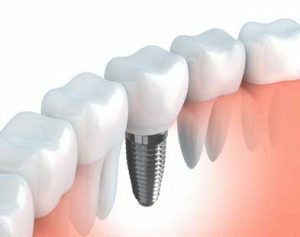 We always place a new tooth over your dental implant which matches to the surrounding teeth perfectly. No-one ever has to know! These treatment and many more are all carried out by a cosmetic dentist. If you are trying to find a trustworthy local cosmetic dentist in Birmingham then look no further. As one of the top cosmetic dentists around, The Dentist at Liberty Place combines experience with all the latest, pain-free, often needle-free techniques to give you the smile that you deserve. Our dentists always use the most aesthetic filling material to ensure your tooth always looks as naturally beautiful as possible. At the Dentist at Liberty Place our patients journey is so important as we understand that the process to a beautiful smile is a worthy investment. Our patients believe we are the best cosmetic dentist in Birmingham and their smiles prove it! A healthy smile is always paramount before making any cosmetic changes. On a healthy mouth, cosmetic dentistry works better and lasts longer. Treatments as long as they are suitable; are not limited and are available to people of all ages so long as your teeth and gums are healthy. A cosmetically enhanced smile lasts longer on a mouth that is kept healthy and maintained. Our cosmetic dentists will spend plenty of time explaining how to care for your new smile. Our patient care team and treatment co-ordinator will be available to support you from the beginning of your journey and can answer many of our most frequently asked questions, and cost enquiries. Many payment options are available to aid patients with their smile investment. The first part of your smile makeover here with us will be an assessment of the health of your teeth and gums. Your treatment plan will always include the routine care of your smile so that your investment into cosmetic dentistry lasts as long as possible. How do you decide which cosmetic dentist in Birmingham is right for you? With so many dentists to choose from, we understand it’s important to make the right decision before you make your investment. Your smile consultation is the most important visit of all. Our dentists take plenty of time to get to know you and what you’d like to achieve from a change in your smile. Our team of dentists and specialists work together closely here in our Birmingham practice so that you never have to visit any specialists or wait on waiting lists.